Armed adivasis we-nt on the rampage at Raiganj town in Uttar Dinajpur — a part of the narrow strip that connects north Bengal and south Bengal — on Friday, playing out a different script of identity politics the town had never witnessed before. Thousands of tribal men and women with bows and arrows, choppers, spears, rods and sticks mobbed the town against police failure to arrest the youths who allegedly molested two minor girls at the deserted bus terminus on July 10 when BJP called a bandh in Chopra against the murder of a party activist. 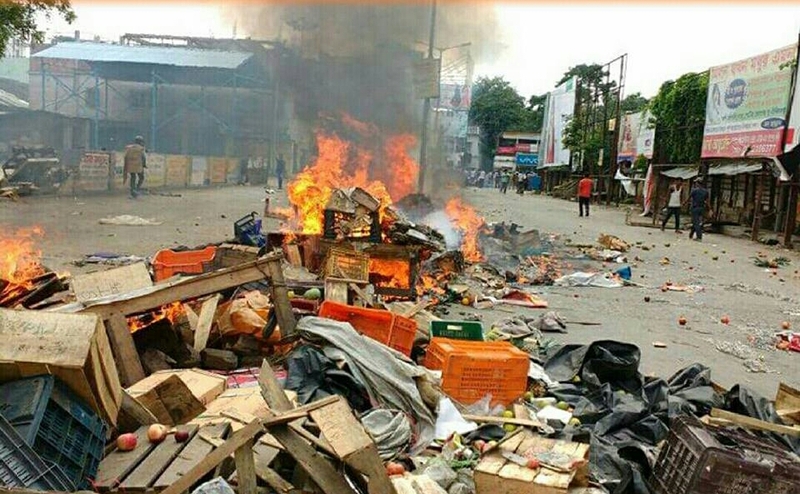 The mob ransacked the terminus, torched cars and two-wheelers parked in front and then targeted shops at Siliguri More, Bidrohi More before holding traffic to ransom on NH 34 for hours. Nine tribal organisations had called the rally at Chanditala on the outskirts of Raiganj. The violence and arson was a sequel to the alleged molestation of four women — Karolina Tudu, a primary schoolteacher, and three oth-ers on July 10. Raiganj Police has rescued two women and arrested three among the accused but didn't take cognisance of the two minor girls. Recounting the nightmare, Karolina said: "The streets were deserted due to the bandh and there were few buses in the terminus. I was returning home with my sister. We were waiting for a bus wh-en we noticed two girls waiting. During this time, a group of five drunkards barged into the waiting room. They held a revolver and asked all of us to follow them upstairs. They took me and my sister to a room and took the two minors to the other room." The miscreants didn't let them go without paying ransom. "We did not have money. I was allowed to call home for money. Taking the opportunity, I called panchayat member Rabin Kisku and narrated our plight in our own language," Tudu said. Soon after, a huge police team reached the terminus and rescued Karolina and her sister. They also arrested three youths from the place. Karolina took up the cause of the missing girls the next day. Initially, police denied the presence of the girls. "We rescued two women and arrested three youths: Nabin Shil, Utpal Chaki and Shubham Prasad. We also recovered a revolver and three rounds of cartridges from them. But we have no information about two more girls," SP Amit Rathore said. With Tudu refusing to give up, police initiated a search and rescued the two minors from Karandighi and Gazole, thus vindicating her complaint. But they couldn't arrest the culprits.